do they know it’s Chrissie? There is something a bit disconcerting to northerners about seeing Christmas lights on flowers. 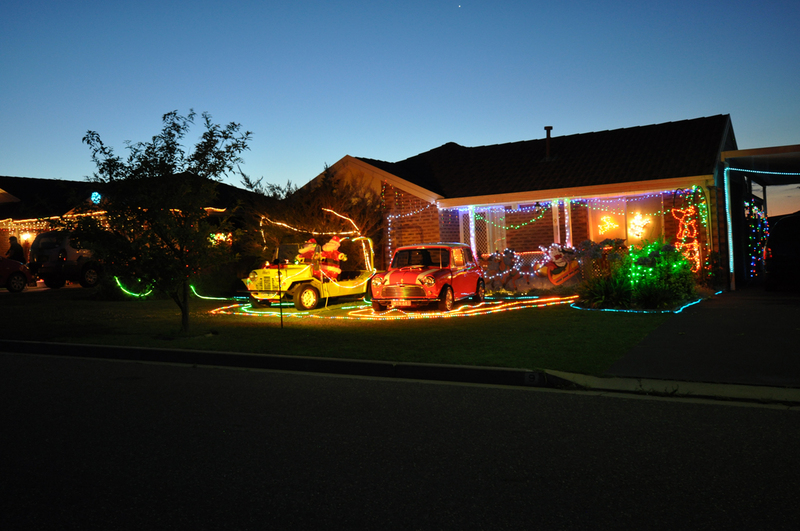 Jeeps and Minis are among the many forms of transport that Santa uses to get to Wagga. In the Aussie tradition of shortening and ee-ing everything, we are now in the throes of celebrating “Chrissie”. Well, we are in the throes of seeing Australians celebrate it, as we don’t really do that much around this holiday. Never have and now that we are here in a whole different environment we are even less interested. Our house is extremely non-Chrissie-ey; there are, of course, the cards that people have sent us (Christmas cards, mixed in with Dan’s birthday cards and sympathy cards about the passing of his Dad – thanks everyone!). And there are a few small gifts sitting on a table that people have given us. But we have done nothing on our own. We had to get rid of our tree for the move (pine cones were a quarantine hazard!) and without a new tree, Lisa’s favourite ornaments remained tucked away in a box. It’s very hard to get into the Christmas spirit in 30+ temperatures. We wouldn't have been surprised to see Johnny Galecki and Juliette Lewis at this house. 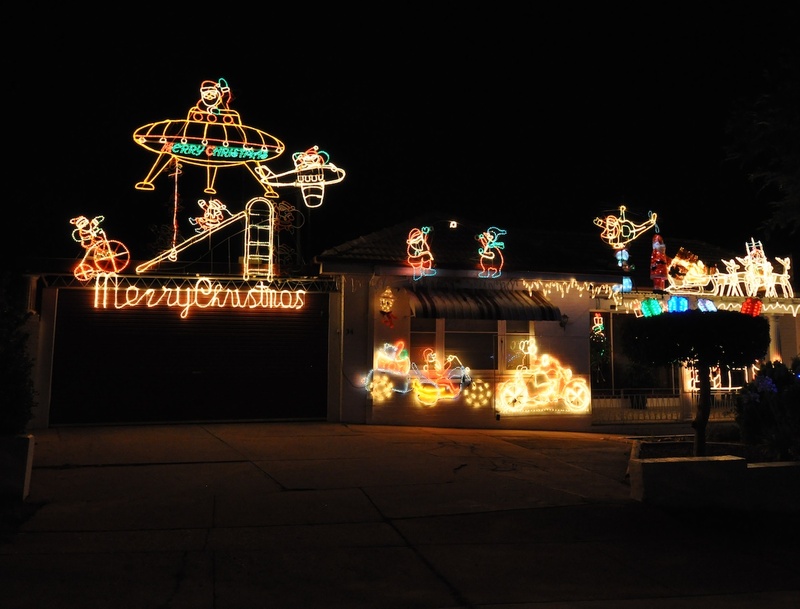 But, at least some Australians are really into Chrissie, in a Clark Griswold freakish way. 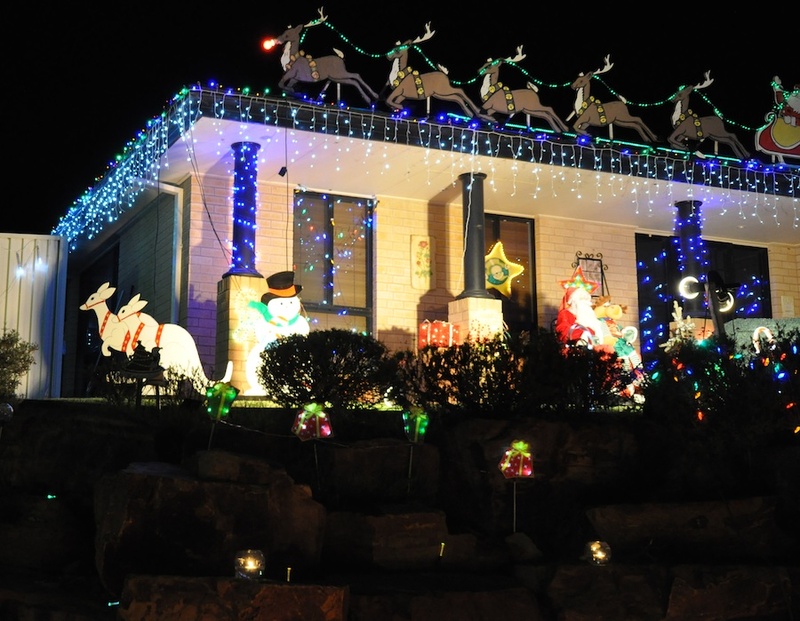 On Thursday last, the Leader (the local free weekly) posted a list of some houses that were decorated for the season. We, and a lot of others (based on how much traffic we encountered), decided we had to experience some of them. The white kangaroos are called boomers and six of them are used to pull Santa's sleigh across the outback. 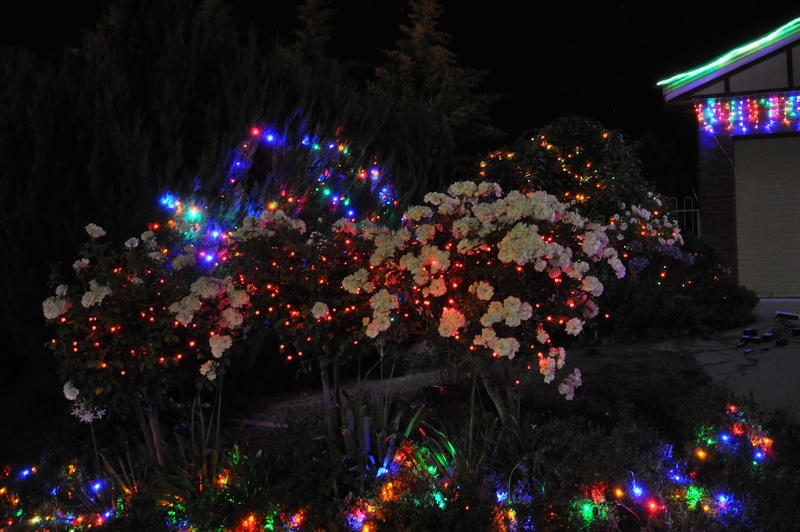 What we learned was that warm weather Xmas lighting is very different than cold weather. First, you can do a lot! In Canada, you slap up some lights quickly and get back inside before you freeze your toes. Here, linger, look, tweak, go nuts…your fingers aren’t going to freeze and fall off, but you might be putting yourself at risk of skin cancer. Second, people looking at lights do it in a different way. Yes, we encountered the lines of cars driving slowly past the lighted houses, but we also saw people walking down the streets with a glass of wine in their hand (have we mentioned that you can drink in public here? With wine being one of the largest national industries, regulating that would be akin to telling Albertans they had to trade in their 1974 Ford LTD that was keeping Suncor in business!). Whereas other people could decide how Santa was supposed to travel, these people were torn between motorcycle, bicycle, helicopter, airplane, or space ship. Most of what we saw was pretty standard stuff – it could have been anywhere, but here it was placed among flowers and grass rather than snow. 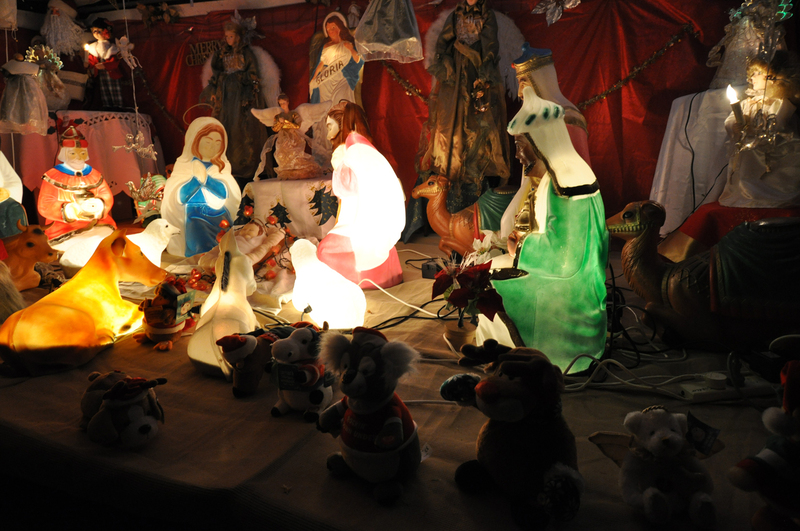 Some of it was noticeably out of place – e.g., reindeer don’t live here. Reindeer don’t live in Canada either, but at least you can imagine them there. There were a few streets where people seemed to band together to all decorate their homes, and when they did it was pretty spectacular. A lot more interesting than Candy Cane Lane in Edmonton. Lots of blue lights, which are pretty eerie. People in Edmonton were using blue lights, but mostly they were LEDs and they didn’t shine too brightly. The ones here are brighter and bolder. And for some reason, the Australian term for Christmas lights is ‘fairy lights‘. Not a lot of interest in getting inside a warm plastic dome when it is +30 degrees! The other bit of Christmas decoration that we have seen is, of course, in the shopping centre. 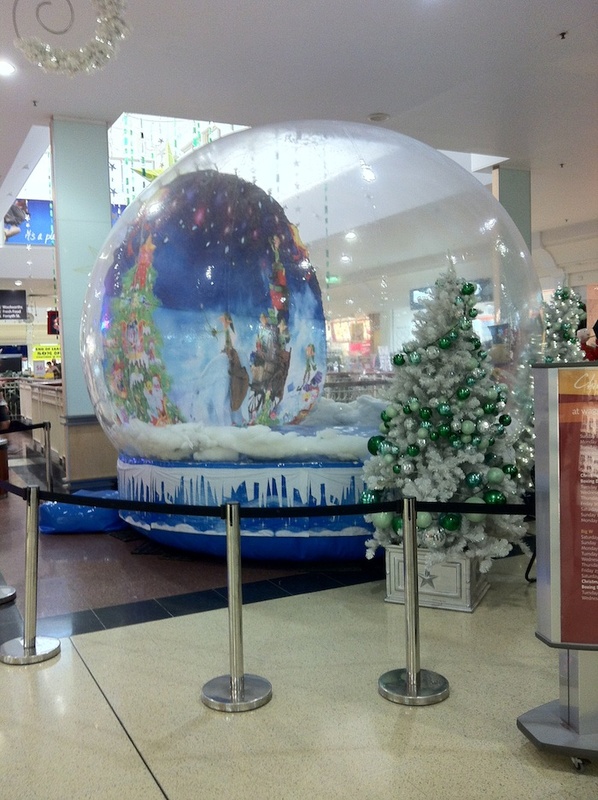 Wagga Marketplace, the (sort of) mall in the CBD, has a Santa. But, they also have an inflatable snow globe that people can get in and have their picture taken, pretending they are in a winter setting. Not a great success…people here really have no interest in snow! We haven’t seen anyone in it. And now it is Christmas Eve here in Australia, and we are off work for about 10 days because, as with our previous jobs, the university closes over the holidays. We are looking forward to some time off. It has been a hectic month, with Lisa hosting a visitor, Dan having to be in Bathurst, a couple of trips to Canberra, etc. We need some down time. We’re not really celebrating Christmas but we have some special things planned for the break. We’ll post about those as they happen. Whether you are celebrating something, ignoring something, or like us just taking advantage of someone else’s religion for a few days off work, we wish you…whatever. Enjoy. This is just a small part of a massive multi-media installation on one front yard. Multimedia as in some of the stuffed animals on the front sing carols. The owner's granddaughter kept them going. This entry was posted in Australia, Christmas, holidays, small town culture, southern hemisphere, wagga wagga and tagged clark griswold, johnny galecki. Bookmark the permalink. 1 Response to do they know it’s Chrissie? Enjoy you first warm Christmas in Oz! After 12 years I still have difficulties with it. However, it’s been such a long cold wet winter and spring here in Sydney that I’m happy to report we have sun here! Much easier to send children outside to burn off their excitement!